The Agriculture at the Metropolitan Edge (AME) program was initiated in the fall 2006 by UC Berkeley’s Center for Global Metropolitan Studies, in recognition of the fact that agriculture is an integral system for sustaining metropolitan regions. The AME program engages faculty, students and practitioners in an in-depth investigation of systems- and place-based issues affecting the urban/rural interface. Through research projects, symposia and publications, the program explores periurban agriculture as one of the basic frameworks for understanding and managing the growth of metropolitan regions worldwide. The first major project of AME was a symposium, “New Ruralism & Other Urban-Rural Sustainability Strategies”, held at UC Berkeley on April 5 – 6, 2007. The Symposium brought together over 200 leading policy makers, scholars, farmers, planners, and activists involved in bridging sustainable agriculture and smart growth. The starting point for the Symposium was the idea that the health and sustainability of our urban areas depends on the vitality and sustainability of the surrounding rural region. In ten interactive sessions, presenters and participants identified research needs, best practices, and policies – as well as multiple challenges – for advancing urban-rural linkages. These informal proceedings resulted from the desire of participants to have a record of Symposium events and presenters. Included are summaries of many of the presentations given, some in document form, some in poster form, and some in Power Point format. • The urban-rural dichotomy doesn’t work anymore. Instead of a hard edge separating discrete interests and uses, the new ‘cutting edge’ is a complex set of interactions and relationships from city center to heartland. • Payments for environmental services provided by sustainable agriculture are feasible given specific conditions. Incentives and compensation must be targeted, standardized, and must optimize benefits in order to make the best use of limited public resources and demanding private markets. 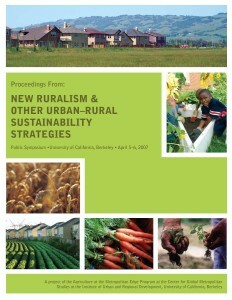 • The most promising land use policies for preserving prime farmland emphasize multifunctionality. Preserving California’s prime farmland while accommodating the projected population growth of 15 million people in the next 20 years requires policies shaped to achieve multiple environmental, economic, and social goals. • Public health concerns are a major impetus for linked urban and rural sustainability. Negative impacts of industrialized agriculture and food systems affect both urban and rural sectors, and include diet-related health problems, inadequate access to fresh nutritious food in low-income communities, and unhealthy, unfair working conditions for farm labor. These problems are linked and so must be the solutions. • Regional food and agriculture systems help provide resiliency to metropolitan regions. Strengthening regional agriculture can mean enhancing economic viability of farms, natural resources, and demographic diversity (especially farmers). As a result, metropolitan regions can be more resilient in the face of global market vicissitudes and climate variability. Local food production can also help reduce greenhouse emissions, a main cause of climate change. • Strategic partnerships and interdisciplinary collaborations are key to addressing complex urban-rural interface issues. Researchers, practitioners, and policy makers are working together more on whole systems problems. However, more incentives and more opportunities are needed.